This was my fourth JDRF ride but my first as a coach. Being on the “other side” of things, which was an amazing experience, I have even more appreciation for the organization as well as the other coaches I served with. If you’ve never been on one of these rides (which you need to do!) I’d encourage you to check them out here. 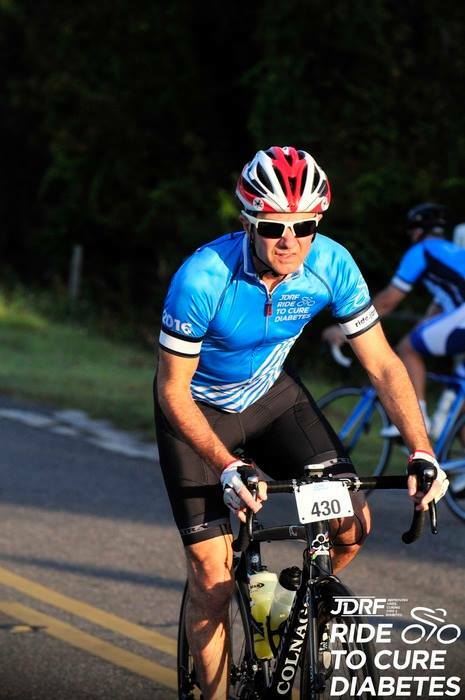 There is so much I could write about pertaining to a JDRF ride, as in how smoothly the logistics go, the amazing staff, and how the weekend feels more like a family homecoming than a bike event. Instead, I want to share my experiences as a rookie coach. That quote is from our handbook and is our mantra, but how does that translate on ride day, especially with such a diverse group of cyclists? On the Loveland ride, we had 451 riders from all over the U.S. (plus some international riders) 44 of which were type 1 (T1) athletes. Of those 451, I’d guesstimate that about 10% were seasoned road dogs or semi-pro/pro racers or triathletes. I wasn’t so concerned about them. It was the other 90% that would be my focus. Thankfully I wasn’t alone; I was one of 38 coaches that weekend. Start at the front with the fast wave and work your way BACKWARD. As one who is accustomed to climbing THROUGH the pack in order to win, this sounded like Zen philosophy. Nevertheless, I tucked it away like a spare tube not knowing if and when I’d need it. I took Ross’ advice and started near the front but my Garmin couldn’t find any satellites, so I rolled along fumbling around with it, oblivious to riders passing me. Remembering that I was there to assist and not wow my Strava buddies with data, I quit messing with it and focused on helping our cyclists. This may sound like Captain Obvious, but in order to help a rider, you need to engage in conversation to find out how they’re doing. Here in lies my first challenge: I’m an introvert. I LOVE riding in silence for miles and I typically ride with others that hold to the same belief. But I’d signed up to be a coach and striking up a conversation with riders was part of the gig. 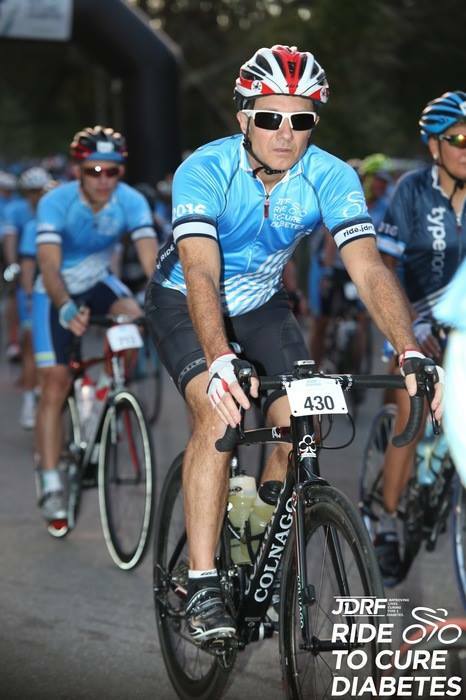 Thankfully, JDRF helps us introverts by putting the rider’s name and chapter location on their jersey number. I rolled up along side a rider, gathered my courage, and dove in. Turned out he was a Novo Nordisk employee who lived in Nashville. We chatted for awhile and then I spun ahead, stunned that I didn’t fall over dead from the experience. Throughout the day, I discovered that conversing with riders became easier and although I’ll deny this in a court of law, I even found the experience…enjoyable. Around the 15-mile mark (I really don’t know since my Garmin was in La-La Land) I joined some riders from Wisconsin and followed them for several miles (see photo above.) Shortly after taking this picture, Andy (#242) hit a pot hole and got a flat. His buddies kept on rolling (nice, guys!!) and I was there like magic to change his flat, which was part of my role as coach. He was very appreciative and we joked about how his teammate should do a better job of pointing out holes. Once repaired, I followed him down the road until I was needed by another rider. I serviced three more flats that day but arrived after they had the tire reinflated so according to the seasoned coaches, these don’t really count. What makes this story funny is that these flats happened to the same 4 Ohio riders throughout the day and I was the coach who arrived after the repair. The pièce de résistance came hours later at the finish. After escorting my riders across the victory line, I headed back out to assist other cyclists. As fate would have it, I met the Ohio riders from “Flatsville!” I pulled up beside them and said, “I’m going to make sure you get across the finish without having a flat!” One guy hung his head in shame but they all crossed victorious and without a flat. But where I shone, in my humble opinion, was as a counselor. Not the type that talks about childhood issues, but in sizing up a rider, and with my gut instinct, discerning how they were doing. Case in point was the north loop. I’ll discuss this stretch of road in more detail later, but this section took a toll on many riders. On my stint, I noticed one of the riders that had previously taken a strong pull seemed lethargic. I slowed the pace and let him pace/draft me. Later that day at the finish line party, he thanked me, saying that I helped him through a rough stretch until he got his second wind. Chalk one up to gut instinct being spot on. Once I got to the T-intersection, we headed south, skirting the mountains to our right. This stretch was relatively flat, the roads were great, and everywhere you looked was big sky country. We had one long ascent (Cat 4), but it was a mild gradient. As I led a cyclist down the other side, I had a National Geographic moment. The sun was still rising so shadows were long, the air was cool, and off to my right, an elk pranced along the ridge. I was SO hydrated that I needed to use the bathroom often. Rest stops were where coaches regrouped, learned how things were going, and then rolled with another group OR got sagged to another location. I never got sagged, which on a personal note I was thankful for, and even got to ride the northern section where the hills were, which I was VERY thankful for. As you can tell by the number of pictures I took, this section of the route was my favorite. I love climbing (yeah, I’m sick!) not only because of the challenge but because of the reward one gets at the summit…an amazing view and the satisfaction of making it to the top. In the above photo, picture the tarmac descending like a black ribbon into a lush valley then off in the distance it ascends up the side of a dam. It was an amazing view, one I wish I’d taken a picture of, but I was in “coach mode” and felt I needed to move along with my riders. At the bottom of the descent, there was a hairpin turn over a bridge before the climb up the dam; it was the only time I took a personal moment to stop and admire the scenery. Two riders from L.A. graciously snapped this photo. We stopped at the rest stop and after I grabbed lunch, I joined another group heading out on the loop. As I mentioned previously, the loop challenged many a rider due to its climbs, the hot temperatures (the high was 97° that day) and the wind. By dinner time, riders talked about it in mythic proportions, making The Loop something horrific that crawled out of a Stephen King novel. The only trouble I had was near the end when as I was helping this T1 Oregon rider (photo below) and my hamstrings started to cramp. I’m not trying to belittle anyone who did have a tough time; I’ve had days when I was extremely tired, hot and a slight incline looked like a Swiss Alp. On this day, I was grateful to be able to press through the cramps and help this young lady back to the rest stop. I’d be remiss without talking about another aspect of a JDRF ride that is stellar, which is the medical and SAG support. Aside from police officers helping us at key intersections, as well as EMS squads here & there, JDRF has their own medics and SAG support patrolling the route. Even when I was on the loop, and it felt like we were in the middle of nowhere, one of our medics rolled past followed soon after by a motorcycle sheriff. As a coach, I had a “scratch & dent” kit for minor cuts & abrasions, but it was comforting to know these men & women were hovering around us like angels, should anything catastrophic happen. Looking back, the best way I can describe my role that day was that it was like riding jazz. We had a route (the song) with a start and an end, and in between were miles filled with improvisation, some of which were awe inspiring, some not so much. You had to be on your toes, ready for change, always moving, an instrument contributing to a beautiful piece of music. Only it was a bike ride and what a ride it was! There aren’t enough words or metaphors to describe how impactful, amazing, and rewarding this ride was. To say I’m hooked on being a JDRF coach would be an understatement. I hope that’s what spilled out of me throughout the weekend. One of my highlights was a tradition the coaches do at every ride. As our Loveland ride wound down and coaches escorted riders to the finish, we reconvened at a location not far from the finish line. Here, we cheered on our cyclists, extending them high-fives, whooping it up like it was the Tour de France. When the last rider crossed the finish, we rolled as a group, an ensemble of jazz cyclists, a peloton of passionate coaches, and made our way across the finish to signal that the ride was over. It was an emotional experience, one I’ll never forget, and is a highlight in my 30-years of cycling. My only regret is that the 2018 season is too far away! Posted on 29 Aug 2017 29 Aug 2017 by J.E. LowderPosted in CoachingTagged Advocare, bike riding, Century bike rides, Colorado Cycling, cycling, cycling in hot weather, fundraising, Garmin, JDRF, training, Type 1 diabetes. Next Next post: 30 At 30A: Love the Beach!